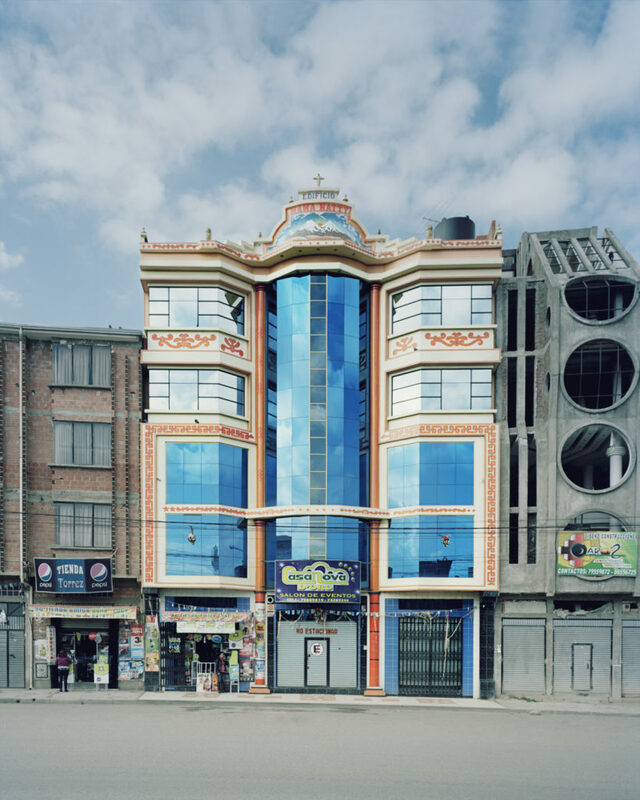 Drawing upon his familial link to the Bolivian region and knowledge of the cultural landscape, Nick Ballon employs his camera in El Alto as the vehicle for an aesthetic and sociological study of the indigenous Andean people through the material objects of their aspirational self-expression. 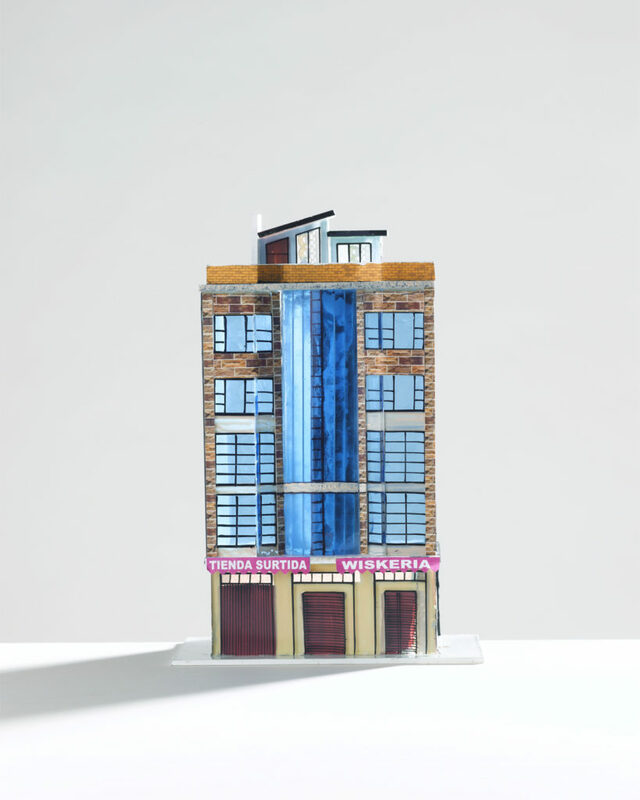 Placing traditional miniatures representing diverse desires next to the physical incarnations of these strivings, realized, the photographer proposes a means of understanding the new Aymaran bourgeoisie’s singular brand of vibrant, futuristic architecture that saturates the otherwise grey skyline of El Alto: namely, as the expression of an identity so endlessly reconfigured, unyielding yet adaptable, that it simultaneously straddles the realms of ancient and modern, Bolivian and European, fantasy and reality. For the indigenous peoples of Bolivia, preservation of a distinct cultural identity has been no small task in the face of colonial oppression, enslavement, and forced religious assimilation by a ruling Spanish elite, who presided over Bolivia’s Andean region for centuries, withstanding countless narrowly-quashed rebellions by the native populations. Even today, the city center of La Paz – which, with its skyscrapers and government buildings has become the commercial and political heart of the entire region – is populated largely by wealthy Spaniards. 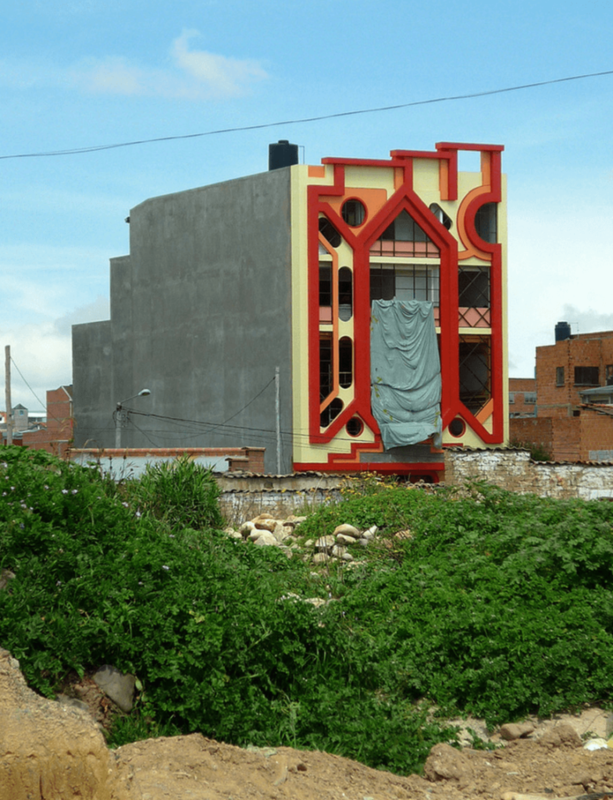 It is only as one travels outward and upward onto the steep slopes of the Andes that the population transitions into majority indigenous Aymara, in an uncommon inversion of the typical urban relations between wealth and altitude. Although the city’s population is predominantly Aymara, the power still rests in the hands of the European ruling class, and the city is host both to the cultural manifestations of its tradition-oriented natives and the highly modern financial and political structure that makes it the Bolivian capitol in all but name. 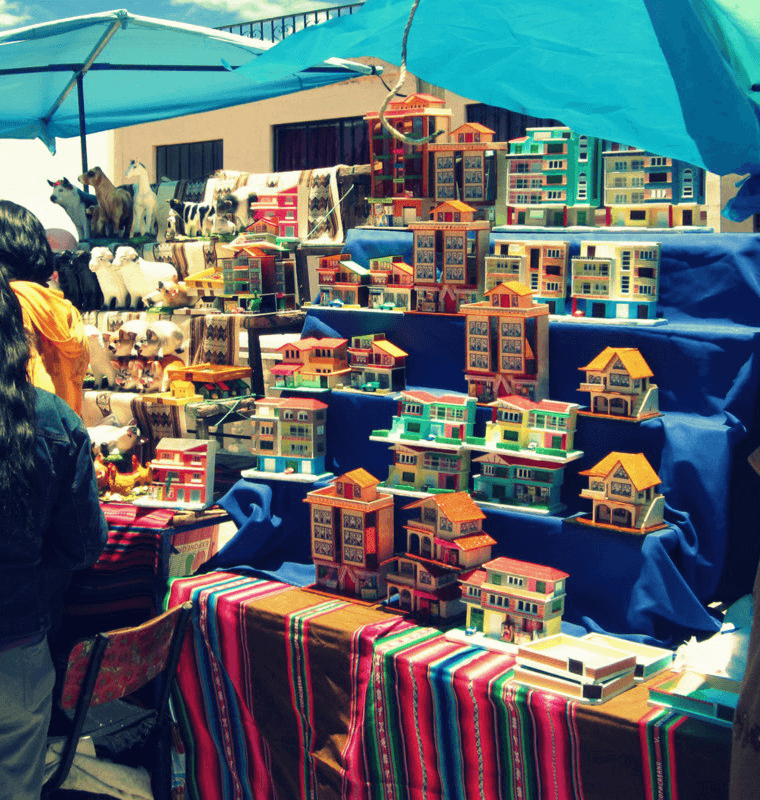 It is here in La Paz, the city with a split identity, that the Alasitas festival takes place, a socio-religious celebration that combines ancient tradition with modern consumerism in the sale of miniature objects representing the buyers’ desires for the coming year. Once purchased, the miniature items must then be blessed, first by a Catholic priest at the cathedral and then by a curandero (a native shaman), representative of Bolivia’s distinctive religious fusion of Catholic and Andean beliefs. Finally, the acquired miniatures are placed under the arms and at the feet of each household’s own miniature Ekeko, the poncho-clad patron of the festival and god of abundance and fortune. Ekeko himself has undergone numerous transformations since his origination among the pre-Columbian Tiwanaku. The grinning icon is particularly associated with the late eighteenth century liberation of La Paz, which ushered in a new era of optimism among the indigenous people and established the connection between the tradition of offering miniatures and the dogged hopefulness of the native peoples. He is always outfitted in traditional Andean garb, typically a poncho, but the range of modern miniatures that adorn and surround him suggest the ancient god is not incompatible with the spirit of globalization. In fact, the Aymara have always been active traders, prior to the Spaniards arrival and even after losing their Pacific coast to Chile in the early twentieth century; nowadays El Alto is still considered a ‘dry harbor’ through which all nature of goods pass from the Far East to the rest of the country. 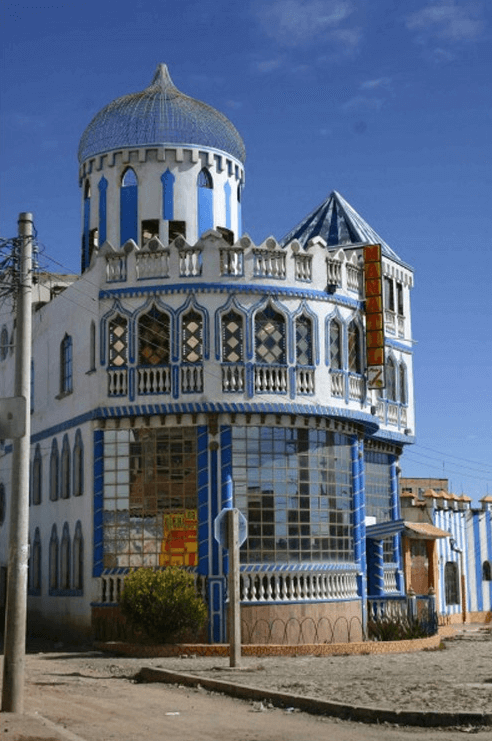 El Alto became one of Bolivia’s largest, poorest, and fastest-growing cities after becoming its own municipality, distinct from La Paz, in the mid-1980s. 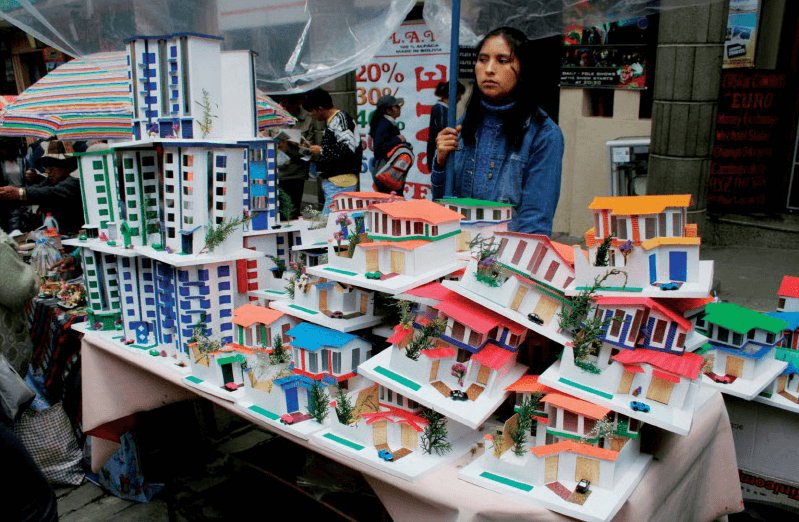 Considered something of an ‘alter ego’ of La Paz, El Alto has suffered rough economic conditions—low employment, limited resources and access to running water or electricity—that have not prevented many of its residents from looking down on La Paz, which they call ‘la hoyada’ (‘the hole’); indeed, El Alto sits on the rim of the Altiplano and so literally looks down on La Paz that sprawls beneath. A certain pride in their collective “urban-rural identity” quickly arose among the majority indigenous population; a large number of the new Alteños were farmers and herders from the rural Altiplano, and prided themselves on both their resistance to adversity and of their ability to retain their traditions in an urban setting. But although many of these new residents were joining others from their home communities, they frequently strove to eliminate any outwardly identifying signs of their rural, peasant origins. Bolivians striving to become more white or westernized generally distanced themselves from the Alasitas fair, seen as a symbol of indigenous tradition and culture, and even the wealthy or upwardly mobile Aymara were reluctant to draw attention to themselves. 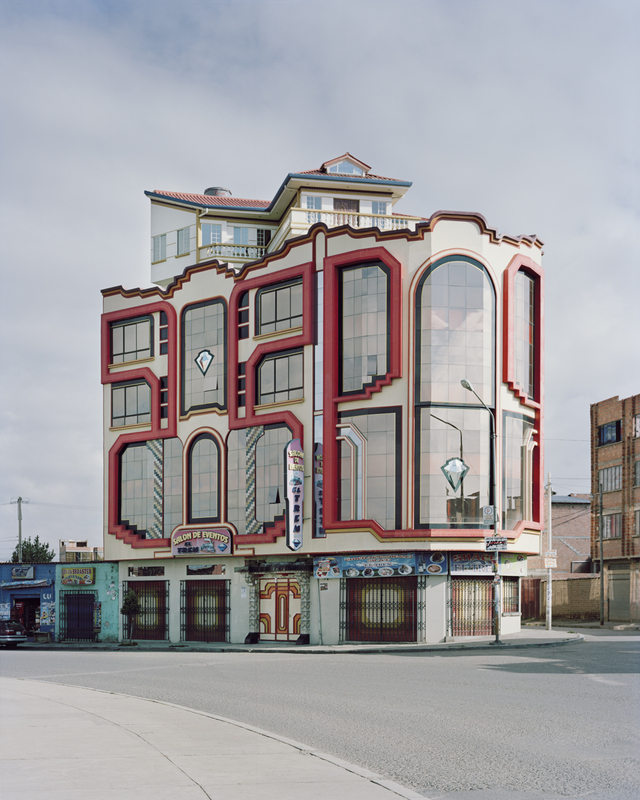 This is visible in the El Alto architecture prior to the turn of the century, which was functionally very similar to the flashy structures that exist today, with different levels serving distinct social and economic purposes, but aesthetically was deliberately banal. 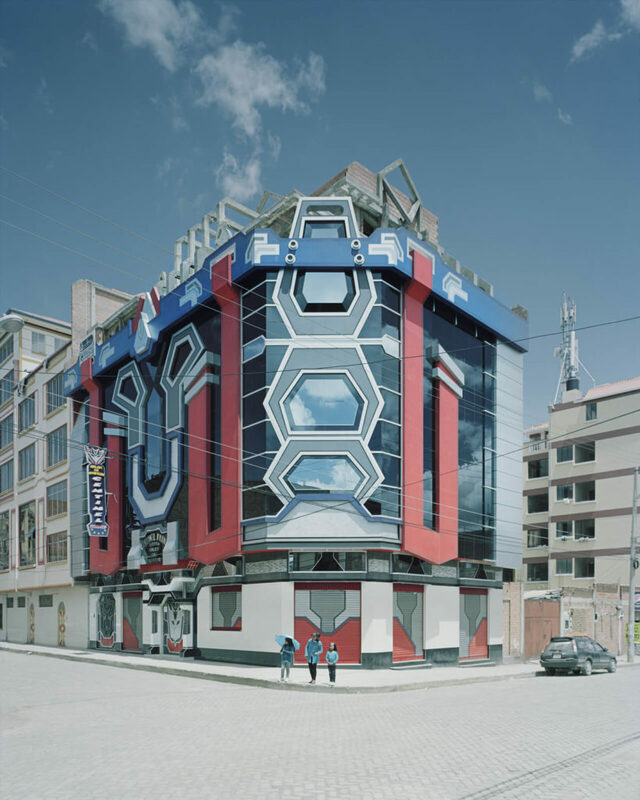 It was not until the turn of the century, coinciding with the election of Bolivia’s first indigenous president Evo Morales in 2006, that El Alto’s indigenous population began to once again wear their cultural identity on their sleeves—and, as a period of increased economic prosperity took hold, on the increasingly extravagant facades of their own homes. 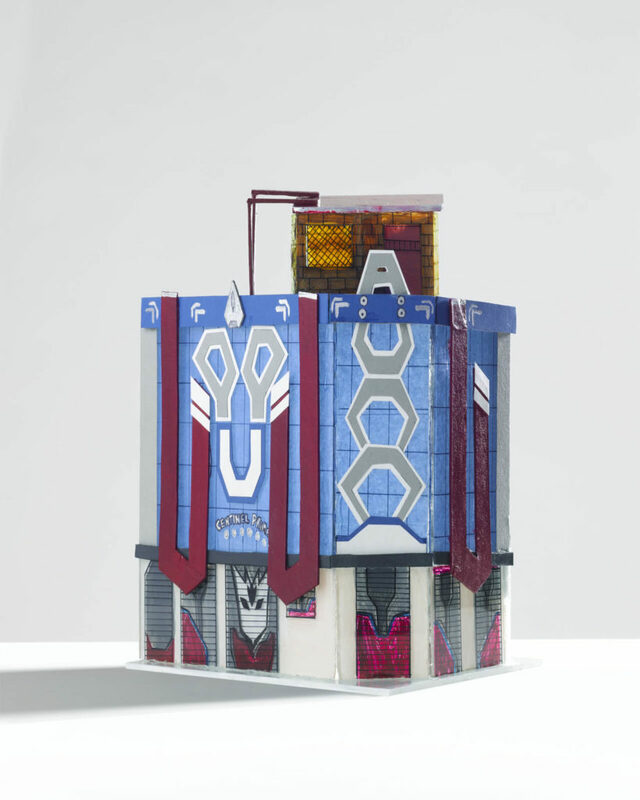 The vibrant, sometimes lurid structures interweave futuristic sci-fi abstractions and Western iconography (see: faux-diamond insignia and a building modeled after the Transformer’s Sentinel Prime) with variations on traditional Andean and Aymara motifs like the Andean Cross, echoing the patterns and palettes seen in their textiles and the ancient Tiwanaku structures. Well over a hundred of these buildings exist, with that number growing by the year. 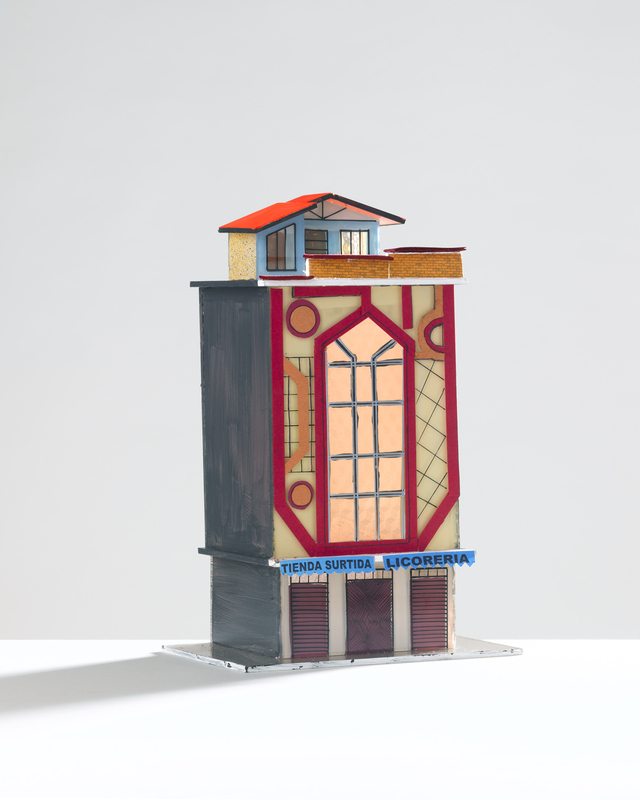 Inside, the structures are typically divided into commercial storefronts on street level, with a rentable party hall taking up the main floors—the interior here tending to mirror the extravagant pastiche of the exterior—and residential apartments up above, for rent or for members of the proprietors and their family. 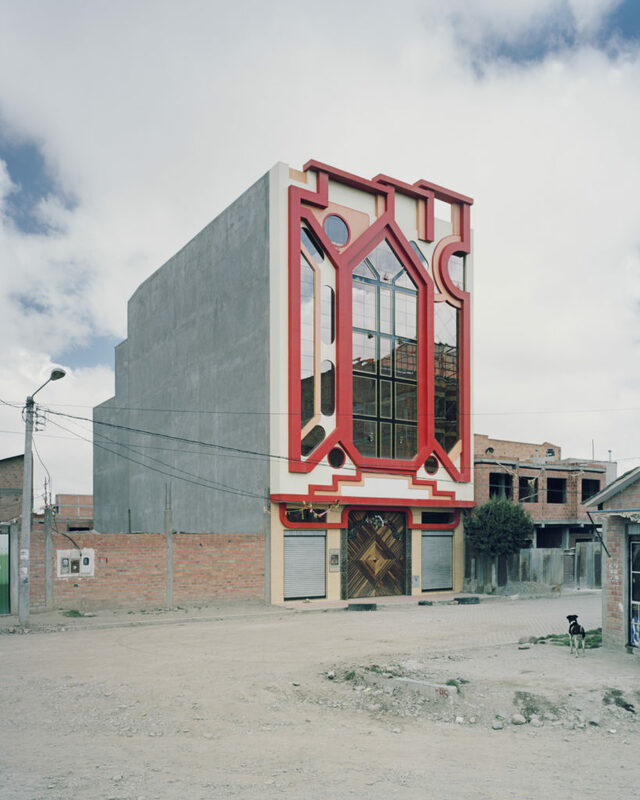 The architectural individuality of these structures is by no means a reflection of the owners’ social mentality, which tends to be one deeply rooted in a sense of community and communal living, deriving directly from Aymara spiritual tenets (historically challenged but not wholly compromised by Christianity). Aymara spirituality is “based on the notion of the binary, of complementarity, of living in function of others and not of oneself,” so that individuals strive to achieve the same reciprocal and harmonious relation with their neighbors as with the natural world and the Supreme Being they worship. As such, although it is generally merchants with some disposable income to spare who initiate these architectural projects, the structures are built with the community not only in mind but often directly involved. 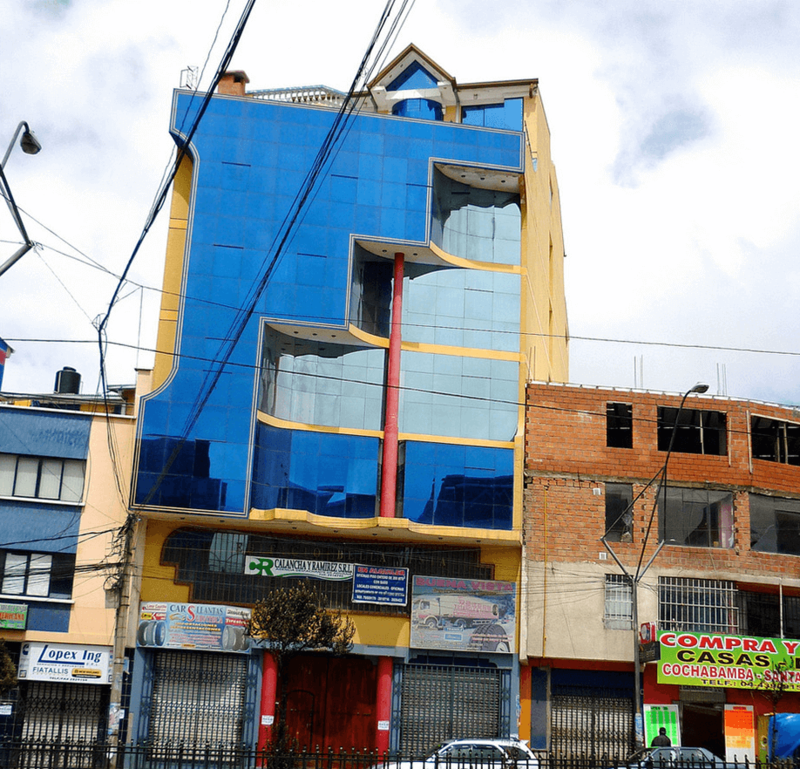 Most new businesses and initiatives in El Alto are funded by way of local financial support—individuals pooling their resources—outside any formal system of loans and banking; all with the understanding that each new venture thereafter will, in turn, receive comparable support from the community and give back where possible. 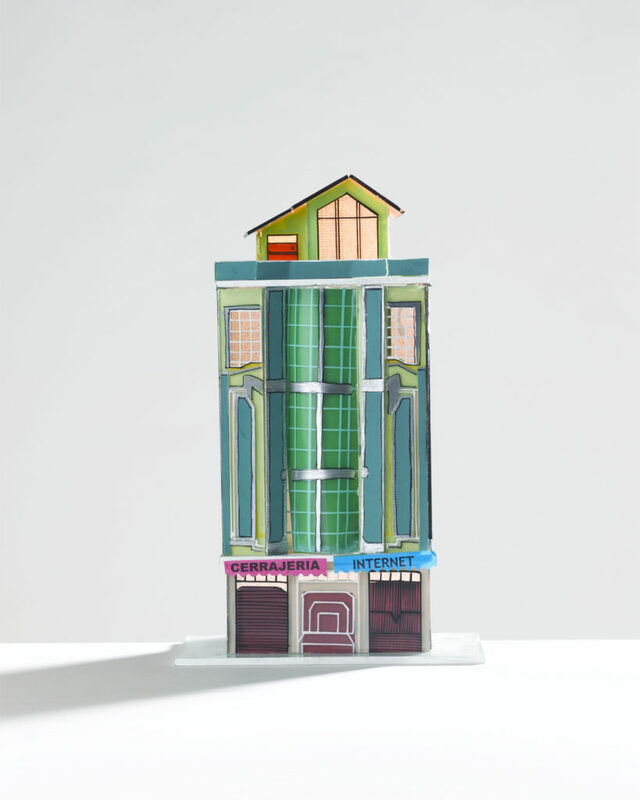 This informal approach to credit and business is similarly mirrored in their approach to construction, with the majority of the involved architects and construction teams having had no formal training and employing highly unconventional and improvisational methods in the building process. 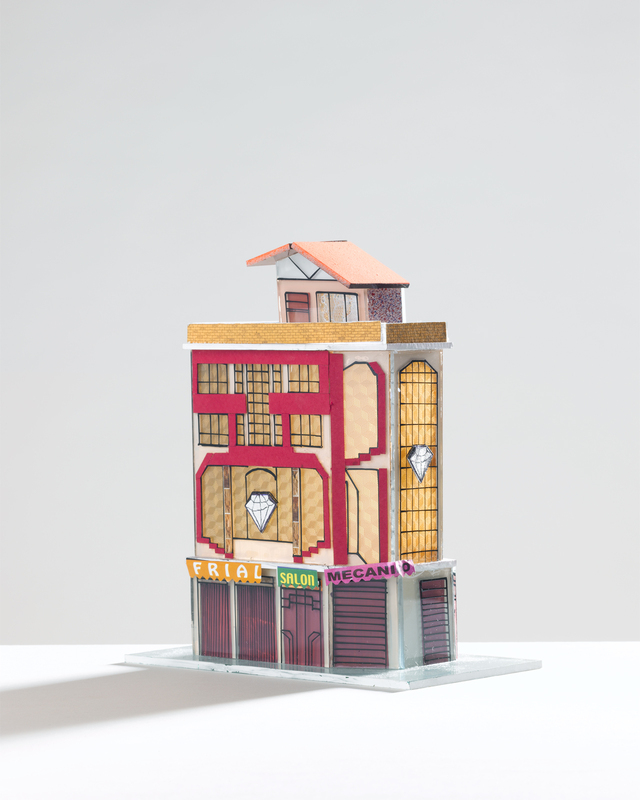 This new Aymara landscape, then, has been constructed on the indigenous people’s own terms, utilizing traditional economic and social methodologies and mapping on the face of these architectural oddities an identity built of seemingly impossible physical and cultural contradictions that nevertheless coexist in an unlikely and vibrant beauty. The aesthetic is in some ways reminiscent of wealthy Roma gypsies’ domestic interiors, lavish dreamscapes of the nouveau riche that combine elements of their cultural heritage with the seemingly fervent desire for singularity—as though compelled by a sense of the comparative fragility of their newfound status to make their mark as boldly and unapologetically as possible. For the indigenous Aymara, these designs are a way, perhaps, of expressing pride in a cultural identity many centuries old whilst simultaneously distinguishing themselves from their ancestors, showing a forward-thinking, modern attitude that will distance them from their rural, peasant origins. For despite natural lapses in ethnic pride in the face of centuries of oppression and marginalization, the indigenous people of the region have demonstrated a special brand of resilience, consistently resisting the ruling class’s efforts to mold them and force acceptance of their cultural and religious practices, particularly Castilian culture and the Catholic faith. It is also worth nothing that the mediated method by which these groups were historically ruled, in conjunction with the segregated and self-contained nature of their communities, granted them a unique ability to preserve many aspects of their cultural identity—leaving them, finally, with a complex heritage that is difficult to define but hardly diminished. 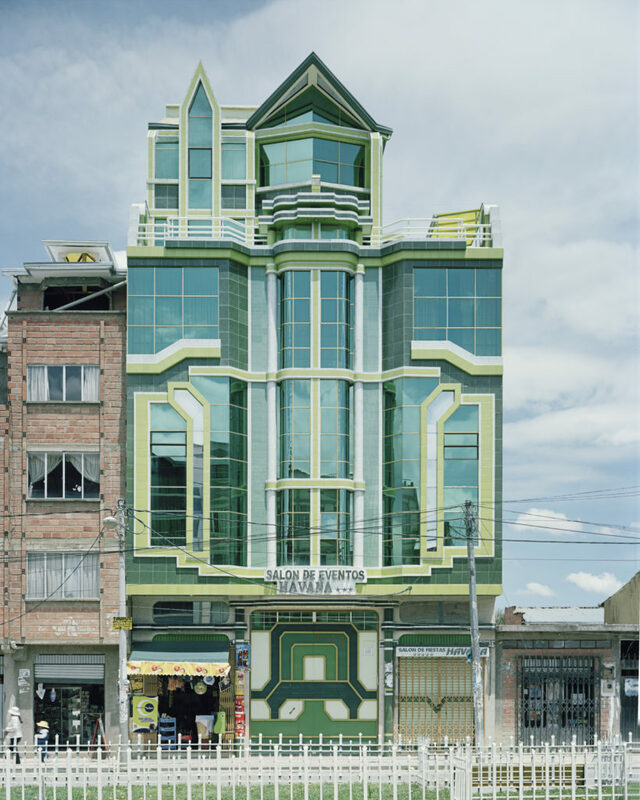 In a sense, the exteriors that are neither strictly Aymaran or Andean or Western or colonial or futuristic, but all of these things simultaneously, are perfectly emblematic of the unique population that reside within. 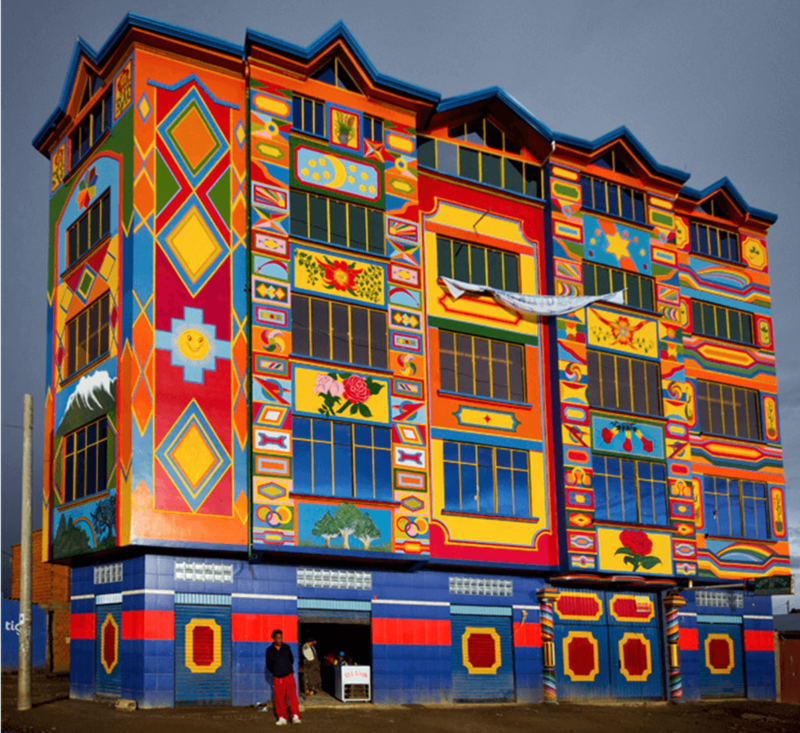 The contemporary Aymara are by no means without a distinct and authentic identity, but it is one that has been infiltrated by a hybrid of multicultural influences, including Western models of consumption and pre-packaged desire, visible in the evolution of the iconography and rituals associated with the ancient god Ekeko. It is, however, through this unique strategy of outward assimilation (and indeed, the unchanging faith in what Ekeko represents) that they have been able to retain and protect the essential aspects of their cultural identity—seen in the interior composition of the flamboyant structures where lie ensconced the integrated layers of communal social living on which their society depends, and around which the physicality of an entire city is formed. All additional images courtesy of Nick Ballon.